As WPP faces break-up calls in the wake of Martin Sorrell's exit, the agency holding company model is under greater scrutiny than at any time since the 1980s. Martin Sorrell was in his element, standing in front of investors in a London hotel in June 2017, at what would turn out to be his final annual WPP shareholder meeting, explaining how his strategy of "horizontality" was working for his biggest client, Ford. What began in 2006 as Team Detroit, five agencies working "horizontally" together to help the car-maker, had morphed into a huge, WPP global unit, Team GTB, in more than 40 offices, Sorrell declared proudly. Satish Korde, head of Team GTB, who had joined the WPP chief executive on-stage, pointed to a slide that showed the logos of "more than 20 WPP companies" that worked on the Ford account. "This picture seems complicated," Korde admitted, noting that Team GTB included no fewer than five PR agencies, but it meant that Ford could get "the best of WPP" – "not on a project basis, but on an everyday basis," he said. For Sorrell, Team GTB was a prime example of what the agency holding company could offer: a portal that provides "a single point of contact and accountability" for a client that wants a range of marketing services as he put it. 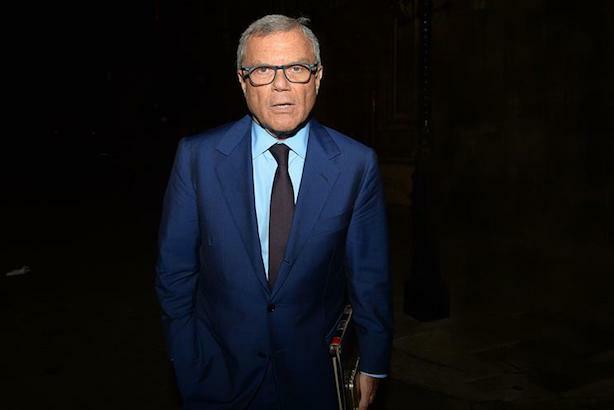 WPP can be "the 21st-century equivalent of the full-service agency," Sorrell added. That now looks a distant memory. At the end of 2017, Ford began to review its relationship with Team GTB, while WPP’s revenue growth has hit a brick wall over the past 12 months and Sorrell departed as chief executive in April. 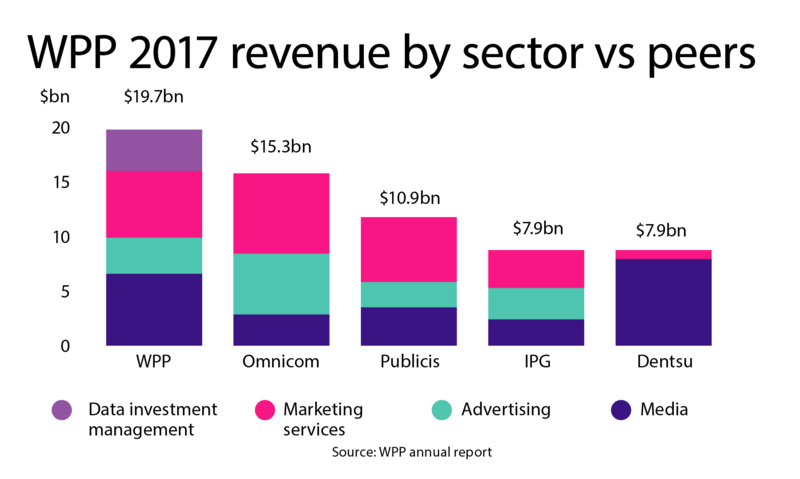 This is a watershed moment not only for WPP, but also the agency holding company model, which is under the most scrutiny since the end of the 1980s, when Saatchi & Saatchi’s fortunes faded and a new generation of global groups, notably Omnicom and WPP, took off. Clients are driving change. The Association of National Advertisers’ investigation into "non-transparent" practices at U.S. media agencies in 2016 was one catalyst, as brands found that cutting fees had led to holding companies taking rebates from media owners and reselling inventory at a mark-up. Digital disruption has been a bigger issue. Brands want greater simplicity, agility, and flexibility as they battle to transform their businesses and provide a connected experience for customers. The holding companies, which have used acquisitions to drive growth, have become too complex and siloed, because they have separate agency P&Ls and office locations. Zaid Al-Qassab, chief brand officer at BT, says, "As new disciplines have emerged and the holding companies have chosen to acquire or develop an agency for each discipline, it has become a much more complex model than is required. As a client, you may need eight or 10 agencies to run a campaign, and that’s just too many." In the case of WPP, insiders say horizontality has relied too much on Sorrell’s force of personality and internal goodwill, instead of moving teams to one P&L. Client leaders and country managers, who have horizontal responsibilty for getting agencies to collaborate, often have limited power (see graphic below). One WPP figure says, "WPP has been like a Westfield shopping mall with lots of specialist shops and different shopkeepers, instead of a John Lewis store with many departments, but only one store manager." All of the big six holding companies – WPP, Omnicom, Publicis Groupe, Interpublic, Dentsu, and Havas – know they must change. Pressure isn’t just coming from clients, which have been bringing some marketing services in-house and buying directly from Google, Facebook, and other tech platforms. New entrants can see gaps in a market where real-time bidding, dynamic creative, and personalization at scale matter more than trading heft. Consulting giants Accenture and Deloitte have invested in digital marketing services as part of a broader "end-to-end" solution for clients, while smaller agency groups such as The & Partnership and Oliver Group have been embedding staff inside clients’ offices. Lucinda Peniston-Baines, managing partner of The Observatory, which managed the recent integrated review for Daimler’s Mercedes-Benz, says, "Clients are looking for brilliant creative, integration, better speed to market, and customer-centricity. The holding company model can be quite seductive in answering that – at least on paper. Where it becomes more difficult is when it comes to ‘operationalizing’ the benefits." She adds, "‘In-housing’ and embedding are massive trends being driven by the need to create low-cost, always-on content." That the agency holding company model is under strain is clear at a time when Procter & Gamble and Unilever, the world’s two biggest advertisers, have halved the number of agencies that they use. Meanwhile, new economy brands such as Amazon and Uber prefer to manage many of their marketing services themselves. Peniston-Baines warns, "It’s a time of huge change and jeopardy for the traditional holding companies." Or as John Wren, global chairman and chief executive of Omnicom, puts it, "We’re rebuilding the aeroplane that’s flying at 560 miles an hour, at 39,000 feet, as we speak." "Good morning, my name is Magnus Djaba and I’m from the creative agency." The man who runs one of the world’s most famous ad agencies wasn’t just being modest when he introduced himself to a roomful of banking analysts at Publicis Groupe’s investor day in London in March. Djaba, global chief executive of Saatchi & Saatchi, and Kate Stanners, his global chief creative officer, avoided any mention of the name of the 48-year-old agency during their presentation. Meanwhile, Arthur Sadoun, global chief executive of Publicis Groupe, was at pains throughout the day to focus on the holding company, not agency brands. Publicis Groupe has, arguably, moved the furthest of the holding companies to simplify its model, with its integrated "Power of One" strategy, after bringing its agencies under four divisions – communications, media, consulting, and healthcare – at the end of 2015. Sadoun has notched up some significant wins, including Mercedes-Benz and Campbell’s Soup. Those clients clearly have bought into the Power of One concept. Publicis Groupe has also expanded its relationship with P&G in the U.K., through a combination of creative, media, data, consulting, and PR, as a result of which the staff from all the relevant agencies have moved into one London office. Johnny Hornby, who runs The & Partnership, has gone further and dropped most of his subsidiary brands, including creative shop CHI, this year. He argues that clients don’t want "a separate bottom line for each discipline, each with a separate big building in every European or global capital" and they don’t want all their agency expertise "off-site." Hornby claims that The & Partnership puts "60% to 70% of every team that we build for a client in their building or adjacent to their building;" his clients include Toyota and News Corp.
By contrast, holding companies are "trying to prop up multiple bottom-line organizations that effectively compete, and they don’t want to put lots of people on-site because they own lots of buildings" and need to fill them to pay the rent, he adds. Accenture Interactive, the most aggressive and acquisitive entrant in the agency space, talks a similar language and is keen to reject the idea it is building a holding company. "We are one Accenture Interactive around the globe, one global team," Brian Whipple, global boss of the consulting firm’s digital marketing division, says, explaining how he tries to integrate every acquisition quickly, rather than keeping them as siloed businesses with earn-outs. Power of One is convincing only if brands buy into it, however. Publicis Groupe suffered a blow in April when Asda, which had moved its creative and media to Saatchi & Saatchi and sister agency Blue 449 simultaneously in 2016, dropped Saatchis in favour of Omnicom’s Abbott Mead Vickers BBDO. "I still believe people buy teams and culture; I don’t think they buy holding companies," the leader of one creative agency observes. Reuniting creative and media after they separated a generation ago is much discussed, but it doesn’t make sense for a client unless the holding company offers the best solution. Mark Read, who became WPP joint COO after Sorrell’s exit, says bringing media and data together could be more compelling. If Publicis Groupe is at one extreme when it comes to integrating agencies and WPP stands in the middle with its "horizontality" model, then Omnicom is at the other end of the spectrum with its federated structure. But Omnicom is also starting to create bespoke agency models for clients, building a full-service agency for McDonald’s under one roof in Chicago and moving staff from media shop Hearts & Science into creative agency BBDO in New York for AT&T. Wren says more clients want this holding-company solution. "They’re no longer simply looking for a particular [agency] brand or particular aspect of our business," he explains. "That allows us to create different types of business models and ring-fence them in such a way that [client] conflicts are not what they once were." Nonetheless, the agency holding company model was likely to change, even before Sorrell’s shock exit. Havas last year became part of Vivendi, the music and TV giant, and its top shareholder Vincent Bolloré could lead further consolidation, although he is facing a corruption investigation. WPP says it has an "open mind" about selling assets, while insisting a break-up of the group doesn’t "make sense." There could also be logic to a tie-up such as Publicis-Omnicom, which failed back in 2014 because of cultural differences. Then there is Accenture’s rise, which has led rivals such as Deloitte, IBM, Cognizant, and CapGemini to look at the sector. The dominance of Google, Facebook and Amazon, is another driver of agency consolidation. However, Lorna Tilbian, a former media banker who sits on the board of M&C Saatchi, says, "The world is big enough to have six holding companies." She doesn’t believe the holding company model is broken: "It’s viable with changes. I can’t see Omnicom and Publicis Groupe being dismantled just because a break-up of WPP has merits." Tilbian adds, "The future for the agency business may be to be smaller and nimbler and more entrepreneurial, and to be closer to the client. At the end of the day, it’s all about creativity, innovation and ideas." Al-Qassab agrees, "The holding company model is probably right. It just needs simplification of the client interface and agility." The holding company has virtues because it can invest in technology and manage talent and back-office functions. But David Abraham, former chief executive of Channel 4 and cofounder of St. Luke’s, believes the agencies have focused too much on "commodifying, bundling, and discounting disparate marketing services," instead of sticking to "the USP of the creative industries, which is to add exponential value through upstream creativity." Abraham has just set up Wonderhood Studios, which combines premium content, marketing, and data services. He argues creative businesses can prosper in the digital economy if they offer something of "sufficient quality that brand owners could not ‘in-source.'" Ultimately, the future success of the agency business depends on people. Some agency leaders believe it is possible for holding companies to put together teams under "a flag of convenience" and treat key people "like Premier League players who move around between franchises." But creative people, in particular, need careful handling and could be tempted to join a client or a tech giant. Scott Hagedorn, global chief executive of Hearts & Science, remains a champion of agencies, describing it as a pirate life versus joining the Navy. "We have to show employees why they should have a career inside advertising and inside the holding companies," he says. "I equate it to, ‘Can we provide them with more fun, more fame, or more fortune than they could get by doing a regular, desk job?’"
What is clear is that no leader has shaped an agency holding company more in their personal image than Sorrell. His departure leaves the way clear for new models to emerge. An earlier version of this story first appeared on campaignlive.co.uk. ‘The big six’: where next? Changes it has made Sorrell capitalized on the rise of programmatic media with WPP’s Xaxis trading desk, and pioneered the creation of bespoke client teams for Ford and Walgreen Boots Alliance among others. Design and branding companies were combined in a single entity, Superunion. Sorrell’s famous "horizontality" mantra meant WPP agencies were encouraged to collaborate to offer clients a broader range of services. 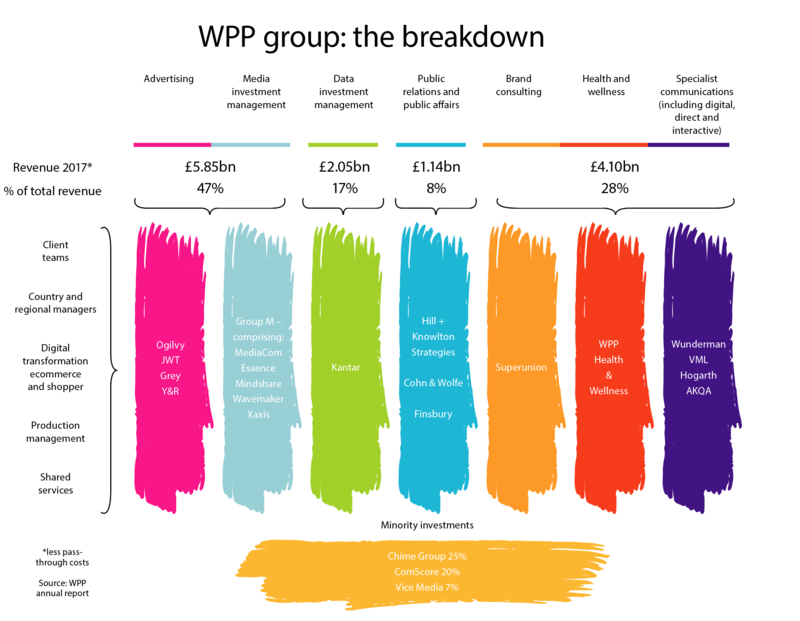 What it has yet to do With more than 160 P&Ls, investors have urged WPP to carry out some internal M&A and kill off – or potentially sell off – underperforming agency brands. With capabilities in communications, technology, data, customer journey and research spread across the group, WPP must find a way to transform "horizontality" from rhetoric to reality. Changes it has made Omnicom emerged as a leader in data-driven media planning and buying with its latest network Hearts & Science, though the agency is yet to take root globally. Its DDB-led, but group-organized, approach to winning McDonald’s U.S. creative business in 2016 showed the benefits of collaboration – something it has encouraged with its new multiagency offices in London’s Southwark. What it has yet to do With John Wren – Omnicom’s leader for 20 years – set to assume a joint chief executive/chairman role, the group runs the risk of placing too much power in the hands of one individual. With WPP currently grappling with a lack of succession-management carried out before Sorrell’s departure, Omnicom’s board should plan for a future after Wren has gone. Changes it has made The group’s much-vaunted Power of One strategy, introduced in 2015 along with a major restructure, marked the beginning of a period of reform, including the appointment of a youthful new leader in Arthur Sadoun. Agencies have been moving into shared abodes, and its AI-powered in-house assistant Marcel promises to take the strategy to the next level. What it has yet to do Like other holding companies, Publicis must find the optimal balance between central collaboration and preserving agency brands and cultures – outside its top markets, for instance, all agencies sit under the Publicis One banner. Clients must also be convinced of the value of integration. While some, such as Mercedez-Benz, have been won over, others, like Asda, have opted against pooling creative and media in a single home. Changes it has made Chief executive Michael Roth believes IPG has led where rivals have followed in terms of restructuring, having launched "open architecture" more than a decade ago. While agency brands such as McCann and R/GA remain, they must be able to collaborate on a client-by-client basis on briefs that transcend region and discipline. Today, all agencies should have digital competency as part of an integrated offering. What it has yet to do IPG has suffered the most from Unilever’s decision to slash agency costs; its shares plunged by 16% last summer when its organic revenue forecast was downgraded. Global media wins for Lego and Amazon (as the incumbent) for Initiative have been useful in recent months, but the company craves a major global client’s integrated business to prove it remains on the right track. Changes it has made Since the official rebranding of Aegis Media and Dentsu to Dentsu Aegis Network in 2014, all the agency brands must answer to a single P&L in each country. It has incentivised agency leaders, meanwhile, by giving them 50% of their bonus from the performance of their shop and 50% from the group. What it has yet to do Without legacy creative agency brands, Dentsu is pinning its future on best-in-class data capability and tech to drive its "people-based marketing" offering. Merkle, the performance marketing shop in which it bought a majority stake in 2016, is set to take centre-stage when rolling out its addressable media platform M1 across the business after a pilot in the U.S.
Changes it has made Havas brought 24 agency brands in the U.K. under one roof when it opened its Village concept in London’s Kings Cross in January last year, creating a unified offer for clients. The group continued to bring disciplines together when it merged its creative and media divisions under one regional P&L in March 2017. Havas also created a centralized management team for its four key markets – the U.K., Spain, France, and the U.S. – with chairmen appointed for each region. What it has yet to do There is still work to do given that the company’s latest financial report in November last year pointed out that spend from major clients Unilever and Pernod Ricard continued to fall. Questions remain on how Havas will leverage its position within the Vivendi media empire, and how it might exploit the financial clout of its parent group to beef up its skills and scale. • An agency team leader must have a direct line to the leadership of the holding company and be "empowered." • The holding company’s team structure needs to be mapped to the client’s organisational structure. • The agency team’s P&L must be aligned to the client as far as possible and the holding company should work to KPIs that are aligned to the client’s KPIs. • Speed and agility are crucial to deliver mass personalization at scale. Knitting together data and insight with ideation helps to manage the customer experience. • Remuneration needs objectives linked to integration, speed of delivery, cost savings and outcomes, rather than outputs.